THIS POST MAY CONTAIN AFFILIATE LINKS FOR WHICH WE MAY EARN A COMMISSION. PLEASE READ OUR DISCLOSURE FOR MORE INFO. What gets people’s interest? I’ve been reading Sally Hogshead’s book “Fascinate: Your 7 Triggers to Persuasion and Captivation” and it has been very enlightening. What gets (and keeps) people’s attention is fascination. Sally walks through 7 forms of fascination that intrigue individuals for one reason or another. One of the 7 is mystique. Typically, mystique is formed when something is withheld. It’s the anticipation, the wonder or curiosity that drives humans positively nuts and gives them tunnel vision when it comes to finding the missing piece of the puzzle. Let me give you some examples from Sally’s book. Colonel Sanders had his “11 herbs and spices” that were (and still are) mixed in 2 separate facilities. Coca-Cola’s secret ingredient, affectionately called “Merchandise 7X” has been under lock and key since 1886; the entire formula since 1925. Secrets build mystique. What does any of this have to do with writing articles, blog posts or copy? Take the subjects out of your headlines or blog post titles and social posts and replace them with the word “this,” “it” or “here” and see what happens. And “it?” That works just as well. “I don’t want my expensive granite countertops harmed! I paid too much for them. What is this ‘it’ that can save my investment from damage?” is what your readers will be thinking. They’ll be compelled to click to find out more. Lastly, the word “here” has the ability to sprinkle a bit of pixie dust, too. 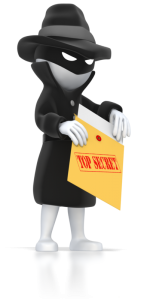 You see how leaving your reader hanging can entice them to click or read on to get the missing secret? This technique isn’t just for headlines. You can apply this same idea to the body or your articles, blog posts or copy, too. As you write, continue to refer to the subject of the article/copy as “it,” “this” or “here.” The longer you do, the more your reader will feel compelled to follow along. They’ll consume much more of your copy/content than they might have done otherwise simply because they want to know what “this” is. That’s not the only way to drive people to your site or deeper into your site, however. Using shot blurbs of copy (like the examples above) is a sure way to drive more targeted traffic to your site. When people read your captivating social media posts, article titles, email subjects, AdWords ads or any other tiny snippet of text, they have to click to find out more. There simply isn’t enough room to tell the whole story in 10-15 words. Discover my favorite strategies for driving traffic through headlines, tweets, titles, subject lines, PPC ads, bullets & more. 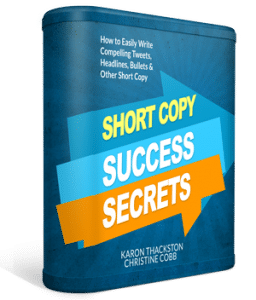 Get “Short Copy Success Secrets” today and significantly improve response to your blog posts, web pages, emails, social posts & more! Use coupon code SCBLOG (no spaces) and save $10. Copyright © 2019 Marketing Words Copywriting Blog. All Rights Reserved The posts contained within this blog are the sole property of Marketing Words, Inc., and full copyright privileges are held by Marketing Words, Inc. A limited, free reprint license is granted to those who wish to reproduce this content in full provided live links to the original posts are used with the content reproduction. 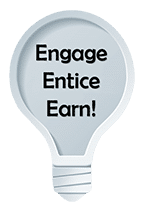 None of the content contained within this blog may be used for revenue-generating activities (posts on blogs that use AdSense, in ebooks, etc.) without the express, written, prior permission of Marketing Words, Inc.